Pastor Steve has not always been Pastor Steve. And has not always been in Brainerd. Born in Chicago in 1969, all of his sports alliances tie back to his childhood there. Bears, Blackhawks, Bulls and of course the White Sox. Growing up in the Chicago suburb of Schaumburg, where he graduated high school in 1987, his faith grew while attending Lutheran elementary schools. 3 years at St. John’s in Roselle and 3 years at St. Peter in Schaumburg. Steve learned and loved singing, drama and all sports (but leaned to HATE running. Ok maybe hate is to strong of a word. In fact, it’s not really the runny that he hated, it was more that no matter how fast and hard he ran, usually he would lose races to cute little old ladies with walkers. How slow was he? If he would run behind a push mower he would have to restart at the beginning before he was done. Grass grows faster than he could run. He quickly (pun intended) changed his focus from sports to music and drama. Although he didn’t give up his dream about being on the field. During his Sophomore year he tried out for cheerleading. Of course, he didn’t make it, he was (and still is) very unathletic. But that didn’t stop him. His Senior year he was the school mascot. He didn’t have to be fast or very athletic, he just needed to enjoy being in front of people and there he thrived. Through high school he remained very active in his church youth group. He even went on some youth ministry trips to different places around the country by himself. He loved the Lord and he loved to see people smile. Steve loved to learn, but when it came to reading… Well let’s just say that he could run faster than he could read. So after 1 year of college an opportunity to be a part of a traveling musical ministry team came up. And he signed up as fast as he could. Steve traveled for a year with a team from Lutheran Youth Encounter, “Common Bread.” LYE was based in Minneapolis, MN. Common Bread traveled the East Coast of the United States from Main to Miami. Living in a van with his teammates 6 people in all who for the most part had never met before. A girl from Iowa, a girl from Minnesota, a girl from Maryland, a guy from Ohio, a guy from Maryland and Steve a guy from Chicago. Each day they would drive to another church in another town and would put on a concert. Each night they would stay in strangers’ homes (Host Families from the churches). It was an amazing year. It started to hone some of his skills, not so much musically, Steve’s strengths were in relational ministry. After that year Steve spent the following summer working at the Boy’s and Girl’s Club camp Chisago City, MN. 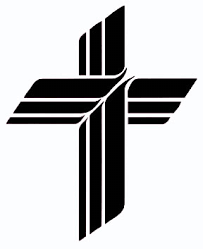 That summer was followed by a year living in Orlando, FL doing youth ministry for the Florida/Georgia District of the LCMS. At the completion of that year, he moved back home to Schaumburg to start going back to school. He attended Harper Community College in Palatine, IL for a year. The year he was a student there he was also a volunteer youth director at a church in Streamwood, IL. During that year he took his youth to a youth event hosted by LYE. There he met a beautiful girl and became very smitten with her. Liz lived in Rockford, IL. He decided that he would have to finish up school quicker so he could do what he truly wanted to do in life. “Marry Liz!” He needed a job, he needed a career, he needed money for a ring. So he transferred to Aurora University in Aurora, IL. To study social work. During that year of education he was being taught things that greatly conflicted with his faith. While at the same time other things pointed out the areas of pain in peoples lives. He was learning to fix those problems with programs, but his faith kept telling him that the only way to fix to problems was with the Word of God, bringing Love and Forgiveness. During the spring trimester, of that year Steve received a phone call from a church that he had done some work while he was living in Orlando. 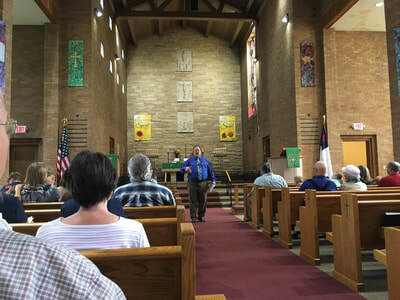 Faith Lutheran Church in Merritt Island, FL offered him the fulltime position of “Youth Director and Assistant to the Pastor.” So Steve did what anyone who was as completely double focused as him would do. (double focused on serving the Lord and marring Liz) Steve sold some of his baseball cards, bought a ring, quit school (AGAIN) and moved back to Florida. Liz quickly followed. So He could become single minded, serving the Lord with Liz by his side. 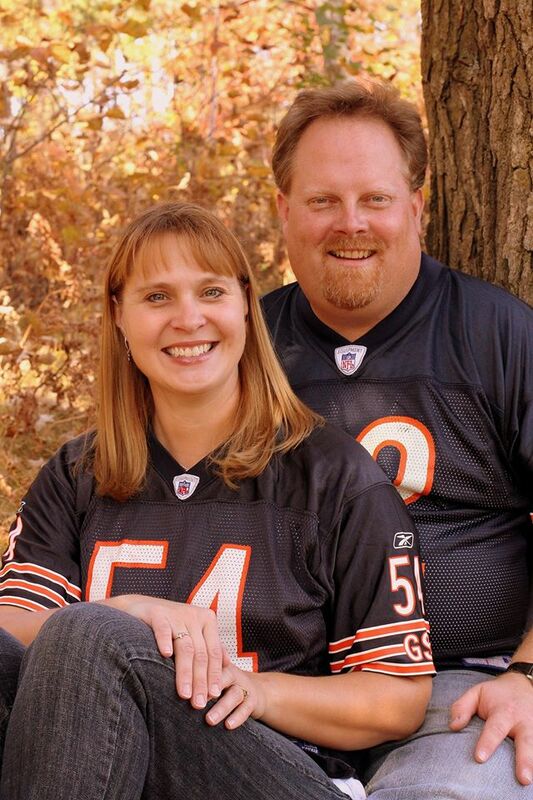 They were married in Oct. of 1992 and served at Faith from June of ‘92 until Dec. of ’95 (Liz taught in the preschool). Steve finished his first degree at Brevard Community College in Cocoa, FL. An AA degree. After 4 colleges, and 6 years he finally received a 2-year degree. While in Florida, Steve was offered an opportunity to serve the LCMS church body by helping out with the National Youth Gathering, starting in New Orleans in 1992. In ’95 Steve received a part-time job offer at Zion Lutheran Church in Hopkins, MN to serve at youth director. The goal was to go back to school and finish a DCE degree. But for some reason Steve’s plans and the Lord’s plans were VERY DIFFERENT!!! After a year and a half at Zion, Steve took a fulltime job at an arts & crafts warehouse, and also taught religion at the Lutheran High School in Mayer, MN for 4 months. In the winter of 1998 Steve & Liz became pregnant. After much prayer and deliberation, they decided to move back to Rockford, IL to let Grandparents spoil the child. As well as with the goal of going back to school to finish a Lay Ministry degree… But again the Lord’s plans were VERY DIFFERENT. They lived with Liz’s mom & dad for a year, that’s where they were when David was born. Steve was working at Menards. The following year they bought their first house. A cute 2 bedroom little place, on the day of closing they found out that they were expecting another child. Steve left Menards and started working at Johnstone Supply a heating and air conditioning supply warehouse. It was there at Johnstone that the Lord brought Steve back full circle. In the fall of 2001, a coworker came up to Steve on day looked at him kind of funny and said, “You’ll fit!” “Excuse Me?” Steve said. Again she said, “You’ll fit.” Then she went on to explain that her family was season ticket holders for the Rockford Lightning CBA Basketball team. And just before opening day they lost their mascot. Steve would fit the costume. So he went to the office for an interview, which consisted of putting on the uniform. And it fit. 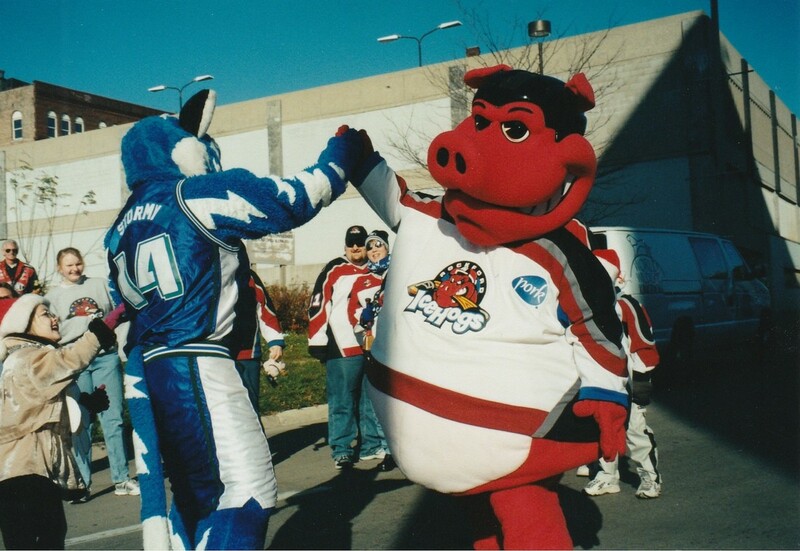 Steve and his growing family enjoyed 4 seasons with the Lightning, and in 2002 when the Rockford Riverhawks baseball team started they asked Steve to be their mascot as well. 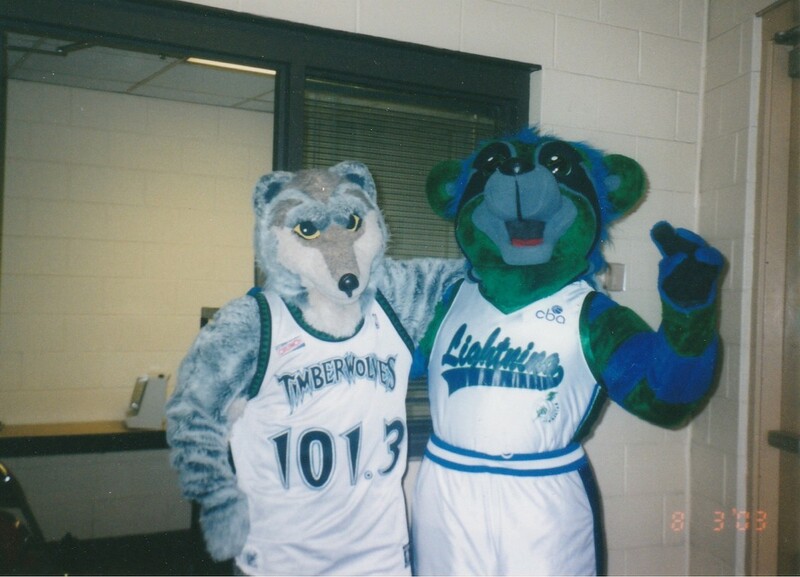 Steve said “no” at first, but after the first season they came back and begged him to be their mascot. And His love for being in front of people and making them smile was to much. 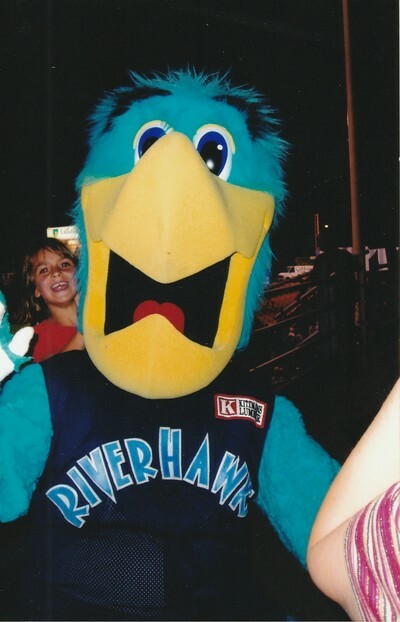 He joined the Riverhawks for the 2003 & 2004 seasons. Winning the championship in 2004. On the night that the Riverhawks won the playoff game to go into the championship or 3rd and final child was born. 2004 was a great year. Not only did the Riverhawks win the championship, and Jon was born, but Steve graduated from Northern Illinois University with a Bachelors Degree of General Studies. After 17 years and 5+ colleges Steve finally graduated and was ready to move on for his Masters of Divinity. A degree that he had wanted since the time he was little Steve. Leading worship in the basement of his parents’ house as a 6-year-old. Wearing his bathrobe backwards and toilet paper for a stole. He was always supposed to be a pastor, but he ran too it as fast as he could. 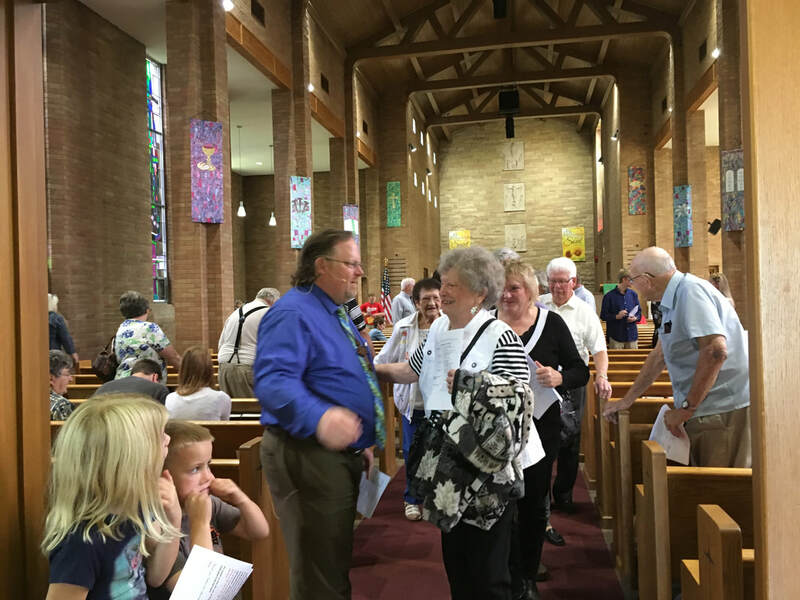 In 2005 the Benson family packed up or sold all of their earthly belongings, put the house on the market, and in a step of faith left Rockford to attend the seminary in St. Louis. 2 years of on campus education followed by one amazing year in Rochester, MN for vicarage (internship). Then back to St. Louis for the final year. Graduation in the spring of 2009 and accepting his first Call to St. Paul Lutheran Church in Pacific Beach, CA for the purpose of starting a church in the hill country of San Diego in a town called Alpine. Lift High the Cross was the name of the church plant. It was an amazing growing time for Steve, Liz and the kids. After almost 3 years, at which time the Lord lead the people of Zion Lutheran Church in Brained to call Steve as their pastor. And that is where he has been since April 1, 2012. Since then he has been trying to figure out who the April Fools Day joke was on...him for coming up here or us for asking him. Click here for words of wisdom, jokes, thoughts, whatever comes to mind from Pastor Steve and other guest authors from our congregation.